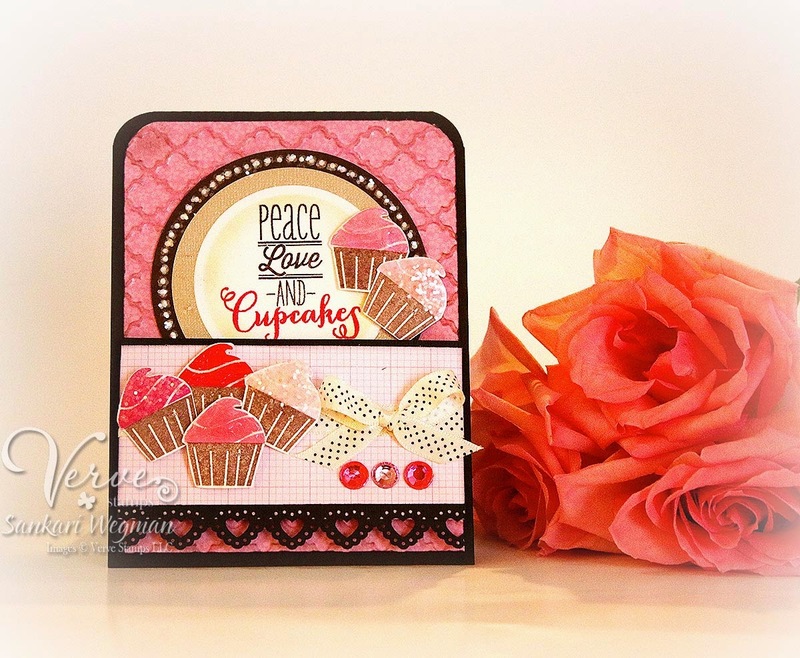 Sankari's Sunshine Corner: 7 Days of Love - Day 2: Peace, Love and Cupcakes! I have been LOVING crafting for these 7 Days of Love cards that I am doing with the awesome Jen Shults of Deconstructing Jen! It has been so so so much fun to create for fun and pull out some super cute sentiments and stamps that I have been wanting to ink up for so long! 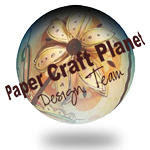 And I love thinking about love and creating with this theme is so healing - gotta love craft therapy!! 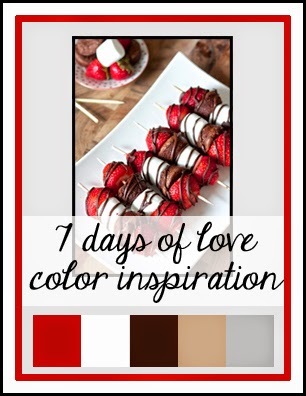 Today - I am using this awesome color inspiration created by Jen! I don't know if did it quite justice - I might have added a few more shades of pink into the red - might have to make another card that is more closer to these colors! What can I say - I got swept away on a sea of pink love! 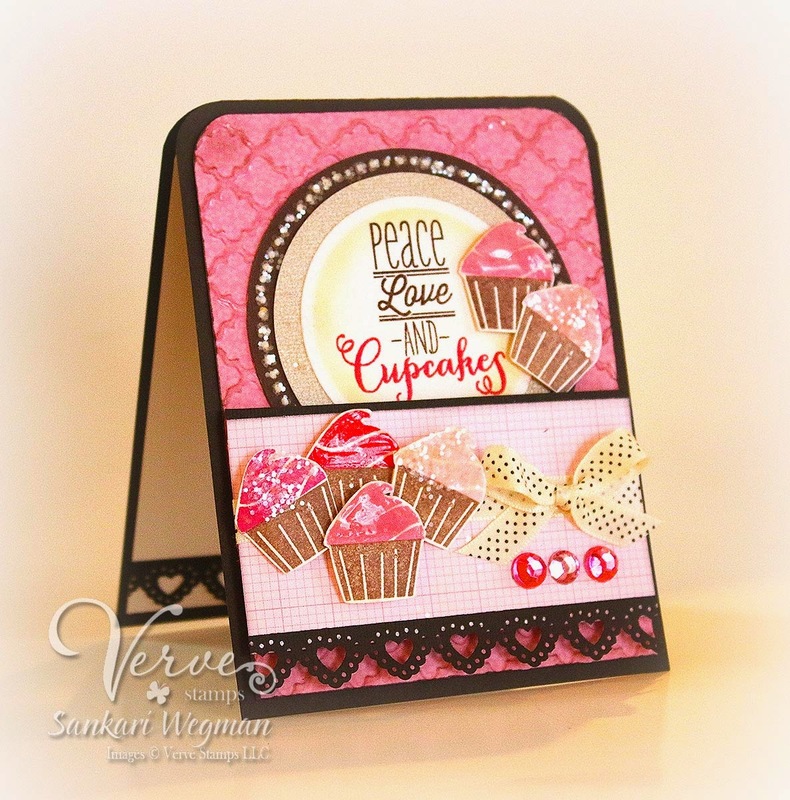 I added some liquid pearls and then some glitter to them for a fun glitterized look and some bling for just a bit more glam :) I added a little bit of the lace heart border on the inside of the card as well --- and now I want to eat a ton of cupcakes!! YUM! 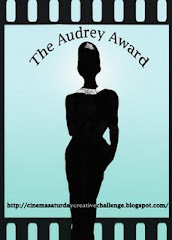 Please hop over to Jen's Blog to check out what love-filled creation she has in store for you today!!! Thanks so much for stopping by today!! Come on over tomorrow for some Day 3 of the 7 Days of Love Cards! 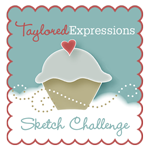 I'm totally enjoying watching your cards for this challenge. Your card is definitely "yummy"! This is beyond gorgeous Sankari! I love the Liquid Pearls with glitter on top! I love how that looks. SO SO awesome. I'm having so much fun this week! Thank you so much for letting me join you this week! That is an awesome sentiment! And your card is gorgeous my dear!!!! Love it!